Keeping track of what is stored in our phones memory is at times a struggle. 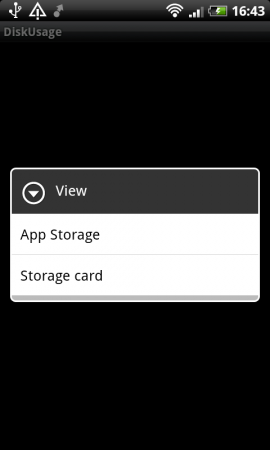 Newer phones like the Nexus S, Desire Z and Desire HD have a large internal memory and large memory cards. Keeping track of what is taking up space is becoming harder. I came across an app that lets you graphically see what is taking up the space. 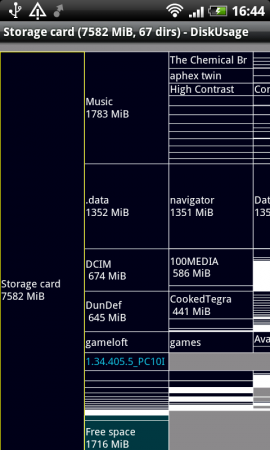 DiskUsage lets you look into either your internal memory or your memory card, it does a quick scan and shows you graphically how much each folder is taking up, when you tap on a sub folder it then expands the next level and so on. I found out that when I uninstalled the Game Avatar it left behind a 230mb folder full of stuff I did not need. I also found out that google maps seems to have a large file to do with French maps stored as well. The app does have it’s limitations though, you cannot delete files and folders with this app you need to have something like Astro.